WASHINGTON — A sweeping $1.3 trillion budget bill that substantially boosts military and domestic spending but leaves behind young immigrant “Dreamers” cleared an important procedural hurdle Thursday as lawmakers struggled to meet a Friday deadline to fund the government or face a shutdown. “This is an abomination of the legislative process,” Hoyer thundered, holding up a bulky print-out as debate on the measure began. He invited any lawmaker who had read the entire bill to join him in the well of the House. No one did. Hoyer then admitted he hadn’t read the bill either. Despite those complaints, congressional leaders were hoping to approve the bill in the House later Thursday and send it to the Senate for a final vote. 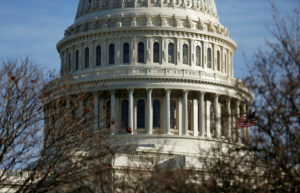 A stopgap measure may be needed to ensure federal offices aren’t hit with a partial shutdown at midnight Friday when funding for the government expires. “It’s a good thing we have Republican control of Congress or the Democrats might bust the budget caps, fund planned parenthood and Obamacare, and sneak gun control without due process into an Omni … wait, what?” Paul tweeted. Most essential was support from Trump, who has been known to threaten to veto legislation even when his team is involved in the negotiations. Word of Trump’s discontent on Wednesday sent Ryan to the White House with Senate Majority Leader Mitch McConnell on the phone. White House aides said the president’s support was never in doubt.